Elizabeth Taylor’s pear shaped diamond, also known as the Taylor Burton diamond, has an amazing history. Before we delve deeper into the stone’s story, let’s take a look at just a few basic facts. This famous gem that’s often referred to as Elizabeth Taylor’s diamond started out as a rough stone weighing in at an amazing 241 carats. It was originally 48.2 grams, a bit smaller than some other notable diamonds sourced from the same mine in South Africa. The original Taylor Burton diamond has been re- cut since being sold to its current owner. It weighed in at 69.42 carats when purchased by Elizabeth Taylor and Richard Burton. 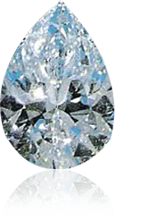 Just like some other notable stones including the fabled Cullinan and Golden Jubilee Diamond, the Taylor Burton diamond was sourced from the Premier Diamond Mine. Discovered in 1966, the massive rough stone was cut into a 69.42 carat pear-shaped gemstone by none other than Harry Winston. The stone was put up for auction on October 23, 1969. When Elizabeth Taylor heard about the upcoming sale, she had to see it, so it was flown to Gstaad, Switzerland for viewing, and then back to New York for the auction. Taylor’s husband, Richard Burton, had set his maximum bid at $1 million, and had his lawyer, Aaron Frosch, bidding via telephone from London. To further maximize his chances of winning, he had Al Yugler of Frank Pollock and Sons jewelry bidding in the auction room. Despite Burton’s efforts, Robert Kenmore of Kenmore Corporation, which is the parent company of Cartier jewelers, won the auction. Some other underbidders included jeweler Harry Winston, Greek shipping magnate Aristotle Onassis, and the Sultan of Brunei, Hassanal Bolkiah. The final price was $1,050,000, which translates to about $5.75 million in 2015 US currency. This sale beat all previous diamond prices by miles: The previous record price for a diamond was set in 1957, at just $305,000. A proviso of the original auction stated that the diamond’s buyer got the privilege of naming it. Naturally, the stone was christened as the Cartier Diamond. The next day, the diamond was sold to Richard Burton and Elizabeth Taylor for 1.1 million dollars. It was named “The Cartier-Burton Diamond” for a short time, but soon gained fame as the “Taylor Burton Diamond,” as Elizabeth Taylor was the one who would be wearing it. Part of the sales agreement for Elizabeth Taylor’s pear shaped diamond was that it could be displayed at Cartier’s stores in Chicago and New York. After the company took out a large advertisement in The New York Times, approximately 6,000 people stood in line each day to see it in person. After being exhibited, the diamond was taken to Monaco in November of 1969. There, Richard Burton and Elizabeth Taylor took possession of the fabled gemstone, along with three pairs of stockings that cost just fifty cents apiece, but that were only available in New York. As the story goes, Liz Taylor was just as excited to get the stockings as she was to finally receive the diamond she had waited so long to possess. Soon after receiving the famous diamond, Elizabeth Taylor decided that it was too large to be worn in a ring. She had it placed in a necklace instead, and had it positioned so that it would cover a scar from an emergency tracheotomy operation. The million dollar insurance policy by Lloyd’s of London stipulated that the Taylor Burton diamond could be worn just 30 days out of the year, and that Elizabeth had to be accompanied by armed guards when wearing it in public. Additionally, the Taylor Burton diamond had to be stored in a vault. Because she could rarely wear the real stone, Elizabeth had a replica made. At a cost of just $2,800, it was worth a drop in the bucket compared with the actual diamond! Burton and Taylor divorced twice. After the second split, Elizabeth Taylor’s pear shaped diamond was sold to New York jeweler Henry Lambert, for an estimated 5 million in 1978. This translates to about 18.9 million in 2015. Part of the sale’s proceeds funded the construction of a new hospital in Botswana. 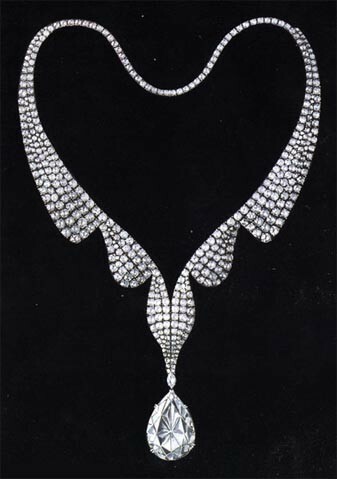 In 1979, Lambert sold the Taylor Burton diamond to Robert Mouawad, of the Jewellers Mouawad. He has retained ownership ever since.